All friends are equally important and they are all beautiful, here is to those friends who are celebrating their birthday. Make them realize that they are beautiful without even knowing, here are to those who are too shy to admit that they are beautiful because what makes them beautiful is the fact that they do not know about it. 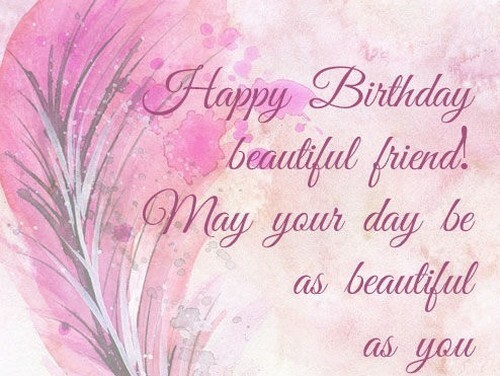 Here are some birthday greetings for your beautiful friend that you can send. You my friend are the most beautiful person I have ever seen in my life, happy birthday to you. 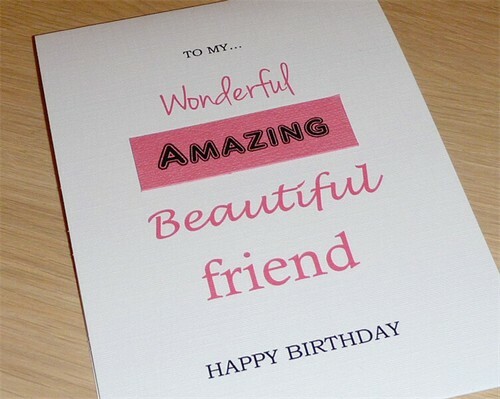 I will always be grateful that you are my friend, know that you are beautiful, happy birthday! 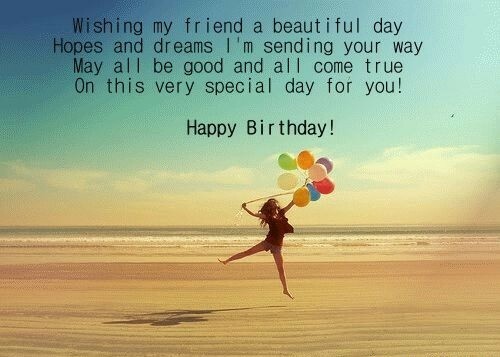 To the most beautiful friend I had ever known, I wish you the best birthday party ever! I hope that this day of your life would be filled with great memories, happy birthday, friend! Our friendship will keep on blowing through our lives, I thank you for it, have a wonderful birthday! I am glad that our friendship is the kind that sticks for a long time, wonderful bday, friend. Happy birthday, my friend, now close your eyes, make a wish and go blow those candles out. Happy birthday, who would have thought that we have been friends for so long now! I miss you and the way we always used to tell each other everything, wonderful bday, friend! There is no better compliment than to have people say that we look alike, wonderful bday! You are not just my friend, you are my sister, you are a beautiful human, wonderful bday! To the girl who always put others first before herself, happy bday to you, my dear friend. I am glad that I had known you for you are beautiful inside and out, wonderful bday, friend. Happy birthday to you, another year has passed and you grew another year older today! Life is fun especially by your side and I am glad that I had stayed this long, wonderful bday! You make me believe in the good things in life, thank you and happy bday to you, dear! You make my life more fabulous and I thank you for it, wonderful birthday to you, my friend. Here is to the beginning of our friendship and hopes that it would last, wonderful bday! To the greatest and most beautiful friend in the world, happy bday to you, girl! You are one of the friends who have always been by my side, thank you and wonderful birthday. It is your friendship that keeps me strong even when I want to give up, wonderful birthday to you. 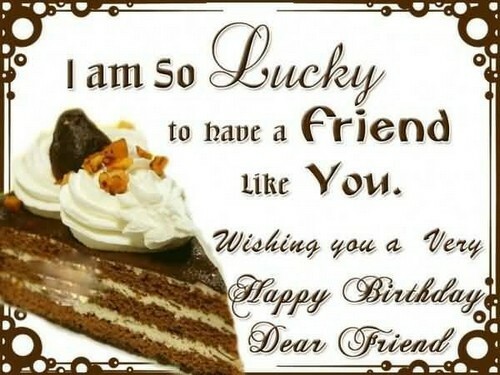 I wish you all the best in all your choices and all that you do, happy bday to you, friend. We are lifelong friends, I am sure of that, I will be here for you, forever, wonderful birthday! I think that our friendship is awesome and I will hold you up to that, happy bday to you. Some days I just sit and think how awesome you are as a friend, wonderful bday, my friend. Do you want to know what the best part of my life is? It is being friends with a person like you. My days would be sad and lonely if you are not by my side, happy bday to you, friend. The best things in life are surely free for you came free to me, wonderful birthday, my friend. I will stick with you, support your decisions and love you forever, wonderful bday, my friend. Thing will get tough and I know that, we may fight and argue but you are still my friend. You will always be a friend to me no matter what others may think about us, happy bday. 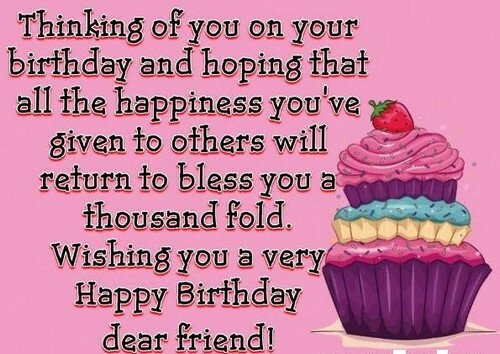 I hope you have an amazing birthday today, my friend, you are loved, keep that in mind. Love is always unstable but friendship is the best anchor to have in life, happy bday! You are worth all the times I waited, you are worth the friendship, happy birthday to you. Thank you for being the friend I never was and the one I will always love, happy bday! I love you and I will keep on loving you no matter what happens in our lives, thank you! 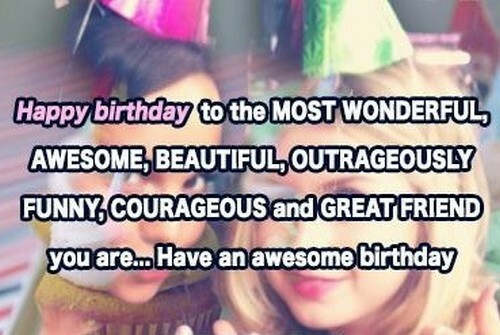 You are awesome, you are unique and wonderful and you deserve a happy bday, friend. To my favorite friend, the most beautiful one in this world, happy bday to you, friend! It seems like I can never get enough of you and that is why our friendship lasts, happy birthday to you my one and only friend. You mean so much to me, if only you had told me sooner, we would have lasted longer. It is your birthday today which means it is time to celebrate our friendship as well, friend. Happy birthday to the most awesome friend this world has ever known, keep being awesome. I wish that I get to spend the rest of your birthdays with you just like this, happy bday! My friend, how can I ever leave you when you are just so cute? Happy bday to you, friend. 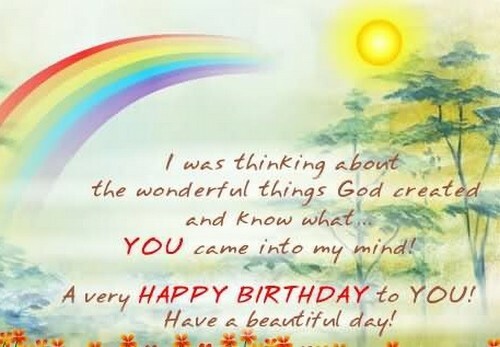 You made me believe that there are still people who are trustworthy, wonderful bday, friend! You are the reason why I still believe in things, why I still believe in the magic, happy bday! You do mean the world to me and I just hope you know that, friend, wonderful bday to you! You might just be crazy but I like that kind of crazy and you know it, happy bday, friend! No matter if we are miles apart, you are still my best friend, happy bday to you, dear! I must tell the whole world just how much I adore you, my beautiful friend, best birthday! I hope that you get to enjoy this day of yours because you deserve it, best birthday, friend. You are the one that has held me tight these years so I do not break down, happy birthday! You have brought me so much happiness than you know, happy b-day to you, my friend. I wish that I can tell you that I am happy for what you are now, best birthday, my friend! Best friends are those that lift you up even when you feel sad, wonderful bday to you, friend. You will always be a kid at heart and that is not really a bad thing, best birthday, friend. Thank you for being that one friend who is always there for me, happy b-day to you! I love you, my friend, I just hope that you know that, wonderful bday to you, forever and ever! You are the only one who can calm me down when I am really mad, happy bday to you! No one can ever break our friendship apart and I love that simple fact, best bday, friend. I have no problems if I spend the rest of my eternity with you, wonderful bday my dear friend. The only difference between the two of us is our parents, nothing more, happy b-day to you! I do not know who I would be if I am not your friend, that is what you mean to me, best bday to you, my most beloved friend of all! You make me believe that there are things in life that would never change, happy birthday! You are one of the constant things in my life and I love that about you, best bday, friend. No words can ever make me feel more secure than you being my friend, happy birthday to you! I love that you make me believe in the greater things in life, thank you for everything, friend. You taught me the joys and wonders of friendship, I will always be grateful, wonderful bday! In this birthday of yours, I hope that you know that I feel you and I love you so much! There are so many reasons why I should be the one beside you right now, best bday! I wish I could tell you not to wait for me because you always do, wonderful bday, my friend. Thank you for being the friend that you are, for telling me that I can do things, best bday! You showed my life direction when I was astray, thank you and happy birthday to you, friend. Friend, you are the light at the end of the dark tunnel I am in, best bday to you! 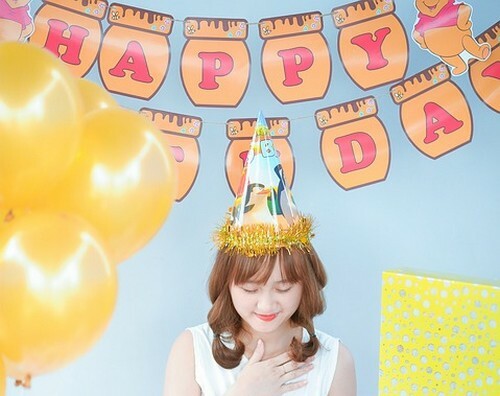 I wish that you get to enjoy your life to the fullest because you deserve to, best bday! Never do things that you know you will just regret later on, happy birthday, my dear friend. Dear friend, know that I will be here to listen to all of your problems, tell me. Happy birthday! You are more beautiful than you give yourself credit for, friend, happy birthday to you! If only I can show you just how beautiful you really are, you would know, best bday! Sometimes, I wish you could see yourself in my eyes so you would know, best bday! I love the way you make me feel, the way you make me believe, happy birthday to you, dear! There is no way I am going back to that place without you, we will be together, happy bday to one of the most beautiful person I have ever met. My friend, may you please tell me that you are still the same person I met years ago? Happy birthday and I just hope you know how much I appreciate the little things you do for me all the time. Time flies by so fast, here we are now, still friends after the years pass by, best bday! You will always be the one friend I would like to keep for the rest of my life, happy birthday! I wish you would tell me just how much I mean to you because you mean so much to me, best bday, friend! There are no words that can explain the feeling I get when you are here, best birthday! There is no other reason why you are my friend but because you get me, best birthday! Thank you for showing me what real friendship means, happy birthday to you, my friend.